At the Dental & Implant Centre we provide a fully integrated high quality implant service. Our aim is to restore or replace teeth as required, from a single missing tooth to multiple teeth and their supporting structures. We strive to restore the smile, improve confidence and enhance the quality of life. Patients can be confident that almost all surgical and prosthodontic stages of their treatment will be carried out by our implant team. You can rest assured that we will continue to maintain good communication with your dentist whilst you are in our care. 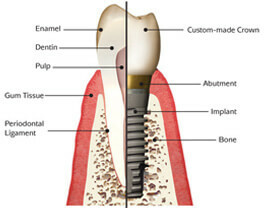 A dental implant is typically a screw shaped attachment made from titanium. It is inserted within the jawbone to the take place of a missing tooth root. Once the bone has attached to the implant, a replacement tooth can be secured to the top of the implant. A new tooth can look, feel and perform almost like a natural tooth. It is also possible to use multiple implants to support a denture or bridge. Dental implants are alternatives to bridgework for permanently replacing missing teeth, eliminating the need to irreversibly grind healthy teeth. Implant secured replacement teeth are more comfortable than conventional dentures because there is restricted slipping or movement of the denture. This eliminates some of the key worries of dentures and improves self-confidence. When teeth are missing the surrounding bone begins to shrink. Dental implants can help maintain the shape and structure of the jawbone. An assessment will be made of the feasibility of providing implants for you. The sequence of the treatment and full cost of each stage will be discussed and detailed in a subsequent written treatment plan. At this appointment X-rays are taken and if necessary a CT Scan will be organised on your behalf. Accurate models are prepared of your mouth and areas requiring implants. A surgical stent is constructed in preparation for the next stage so that the implants can be precisely positioned. Following the loss of natural teeth, the underlying bone may slowly diminish. If insufficient bone remains, a variety of techniques are available to create new bone before implants are placed. The actual operation to place the implant fixture under the gum. These form the foundation and fulfil the same function as the roots of your natural teeth. This operation can be performed with you awake under local anaesthesia, or with sedation, which makes the treatment easier and more pleasant. After a 3-6 month period to allow the implants time for full integration with your bone structure, the top of the implant can be exposed. This involves a small operation usually carried out under local anaesthetic. The gum is left to settle for a few weeks after which the implants can be brought into function. 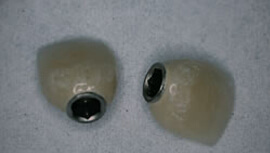 This stage uses the implant to support the replacement teeth. Impressions are taken and the restorations are constructed at a specialist dental laboratory. The types of restoration vary greatly, from a simple crown for a missing tooth to full dentures that are kept firmly in place by two or more implants. 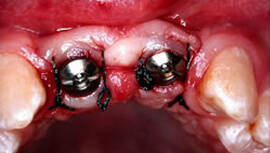 In more complex cases it is possible to construct full mouth fixed bridges using multiple implants. Regular and professional care is important in the maintenance of good dental health. This can be carried out by your regular Dentist. 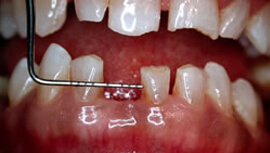 Implant work will not succeed unless immaculate oral hygiene is maintained. Following the completion of the implant treatment, patients are to be reviewed on an annual basis, by the Specialist Surgeon. In the long term, it is necessary to assess and monitor gum attachment and underlying gum support with both radiographs and routine hygienist visits. We have listed a guide to the minimum charges that would be encountered with typical type of cases. 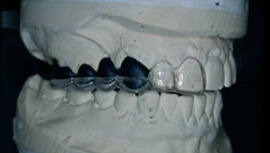 Six implants to support full arched bridge with 10 – 12 teeth. Estimated cost of £14,000 - £16,000. Despite the thoroughness of planning, extra procedures are sometimes required during treatment to produce the best results. It is important that in this event you should accept that appropriate alternative treatment is performed at the time of the treatment, although it may be different to that already planned. We hope to give you prior notification of any changes to the original treatment plan and associated fees. We undertake consultation, assessment with x-rays, to provide you with a written treatment plan. This letter will detail the treatment options and costs. A copy will also be sent to the referring dentist. In some cases, bone grafting may be required. The options for bone regeneration include autogenous bone (patient's own bone-preferred option), synthetic bone, human processed bone or bovine bone. Following the completion of the treatment, you will be referred back to the care of your regular dentist. Annual monitoring of your implant restoration is highly recommended by the Specialist. 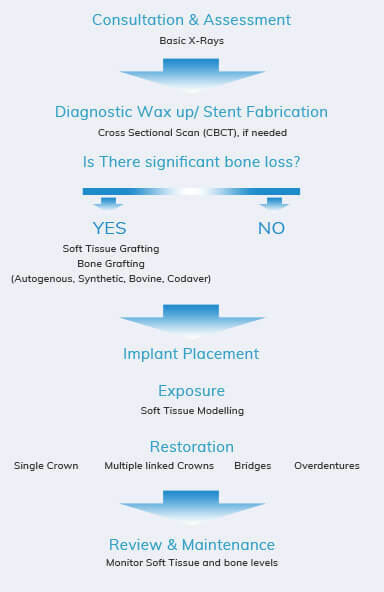 Once the patient accepts the plan by signing a consent form, study models and photographs are prepared, together with a surgical stent, which helps to accurately position the implants. 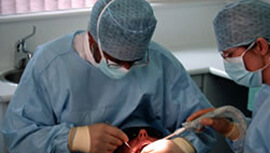 The placement of implants is normally performed under local anaesthesia and sedation using a fully sterile technique. After 3 to 6 months the implants can be exposed to support the final restoration.